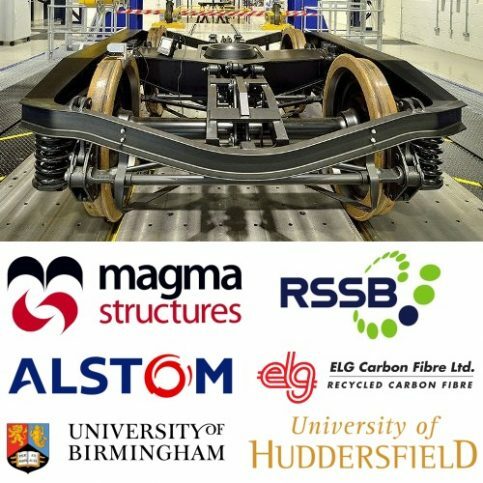 Magma Structures is the lead partner seeking solutions to bogie induced track wear, in a consortium of rail industry specialists including the RSSB and ELG Carbon Fibre Ltd.
Track damage currently costs the UK government millions of pounds a year in track repairs and maintenance. This cost is partly offset to the rail companies by track access charges dependent on the types of train bogie running on the track, with charges proportional to the amount of wear that each bogie design causes. Magma was approached by ELG Carbon fibre, the recycled carbon fibre specialists, to be the manufacturing partner in the design, manufacture and testing of a composite bogie frame that can significantly reduce track wear and costs for rail users and operators. Initial results have shown the potential to reduce the horizontal loads mainly responsible for rail wear by up to 40% and to reduce axle load by 8%. The composite solutions will also include real-time suspension component performance monitoring systems, to reduce the cost and time associated with carriage bogie maintenance.